The forests of the Amazon are home to more species of primates than anywhere on Earth. However, there are no apes (tail-less primates). Amazon monkeys are broadly divided into two groups: those with or without grasping (prehensile) tails. They are all strictly arboreal (tree-dwelling) and don't voluntarily come to ground. Mosty species' main diet consists of fruit of which there is an ample, year-round supply. Generally, monkeys are omnivorous. They feed on leaves, flowers or small animalsespecially insects. Here you can learn about two large monkeys found in the Amazon. 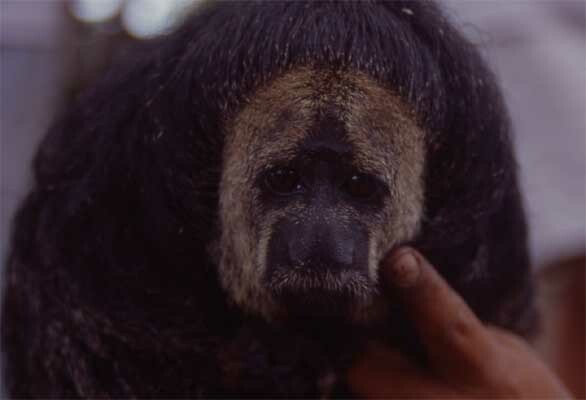 The odd-looking Monk Saki (Pithecia monachus) is one of about half a dozen similar large (saki) monkeys in the Amazon. Its peculiar hair-do accounts for its common name. They quietly roam around the middle canopy in small groups, looking for fruits, seeds and leaves. The Wooly Monkey (Lagothrix lagothrica) gets its name from its thick, coarse fur (as you can see from the dangling tail). 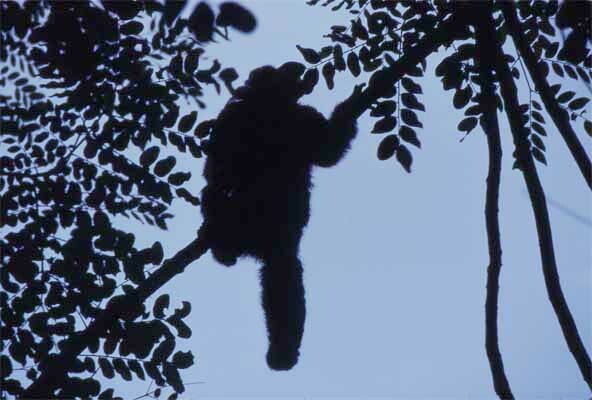 It is a medium-sized monkey, and has a prehensile tail, which it uses as a fifth limb to grip branches. This species is found throughout most of the Amazon.